Often we spend so much time ogling knives that we miss the importance — and the beauty — of a great sheath. Today’s wallpaper aims to correct that oversight. For the record, Kydex is fine but leather is better. Oh, a Kydex sheath may do its job just as well, but really, there’s nothing like well-crafted hide. It sure is more photogenic. The classy leather “pants” featured in today’s wallpaper come from Bark River Knives. 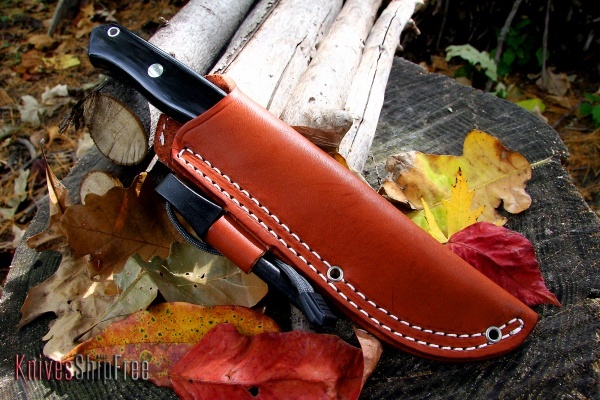 This sheath holds a Camp & Trail knife and a Light My Fire Swedish Army Firesteel. This entry was posted in Bark River Knives, Hunting, Sheaths, Traditional and tagged Bark River, Leather, Micarta. Bookmark the permalink.